The first son of the popular Hired Man bull, and it didn’t take long for Hired Man to show us his progeny power. 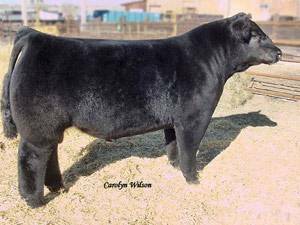 Chore Boy was constructed from a purebred Northern Express Angus female. The bull should follow in his sire’s steps with big bodied, thick, stout, sound, and unbelievable hair. Just like his sire, Chore Boy is TH free and PHA free. Very rarely do you find one with this much mass that is clean.